The cheongsam (qipao) is a female dress with distinctive Chinese features and enjoys a growing popularity in the international world of high fashion. 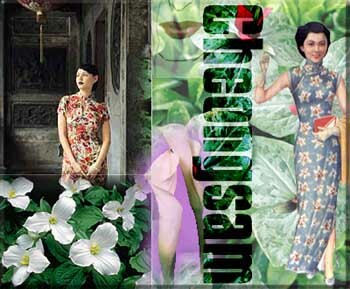 The name "cheongsam," meaning simply "long dress," entered the English vocabulary from the dialect of China's Guangdong Province (Cantonese). In other parts of the country including Beijing, however, it is known as "qipao"(Manchurian), which has a history behind it. When the early Manchu rulers came to China proper, they organized certain people, mainly Manchus (Manchurian), into "banners" (qi) and called them "banner people" (qiren), which then became loosely the name of all Manchus (Manchurian). The Manchu women wore normally a one-piece dress which, likewise, came to be called "qipao" or "banner dress." Although the 1911 Revolution toppled the rule of the Qing (Manchu) Dynasty, the female dress survived the political change and, with later improvements, has become the traditional dress for Chinese women. Easy to slip on and comfortable to wear, the cheongsam (qipao) fits well the female Chinese figure. Its neck is high, collar closed, and its sleeves may be either short, medium or full length, depending on season and taste. The dress is buttoned on the right side, with a loose chest, a fitting waist, and slits up from the sides, all of which combine to set off the beauty of the female shape. The cheongsam(qipao) is not too complicated to make. Nor does it call for too much material, for there are no accessories like belts, scarves, sashes or frills to go with it. Another beauty of the cheongsam is that, made of different materials and to varying lengths, they can be worn either on casual or formal occasions. In either case, it creates an impression of simple and quiet charm, elegance and neatness. No wonder it is so much liked by women not only of China but of foreign countries as well.